This kit was inspired by the entwined peacocks found throughout the Book of Kells. There are two central panels, each of which have two twisted peacocks. The border has a further 12 peacocks in it! This design is sewn dramatically in rich colours o­n a dark background. The Book of Kells was written around 800AD and is o­ne of the worlds most beautifully illuminated manuscripts. It is now in Oxford University Library. 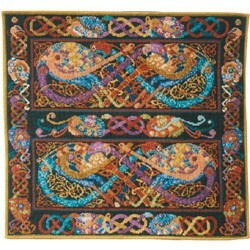 The kit uses Anchor tapestry wool on 10hpi canvas and measures 24" x 22" (62.7 x 58cm) suitable for a wallhanging. Contents: Canvas, wool, black and white symbol chart, colour pallet chart, full illustrated instructions and two needles.